Passionate and curious about Animal Behaviour from a young age, Connie Allen is now pursuing her career ambitions to be a wildlife researcher in Africa. Graduating with a first class degree in Biology from the University of Bristol in 2015 she was quick to move to Botswana to commence her postgraduate on the behaviour of male elephants in the Makgadikgadi Pans National Park with the charity Elephants for Africa.. The wider implications and value of her research to the elephant conservation crisis is truely coming to light, and as the project develops we are in need of financial support for its continuation. Project updates: Every little helps! Thank you for supporting my work, everyone who backs the project will be updated on progress reports through quarterly blogs through the project and email updates. Postcard: High five! 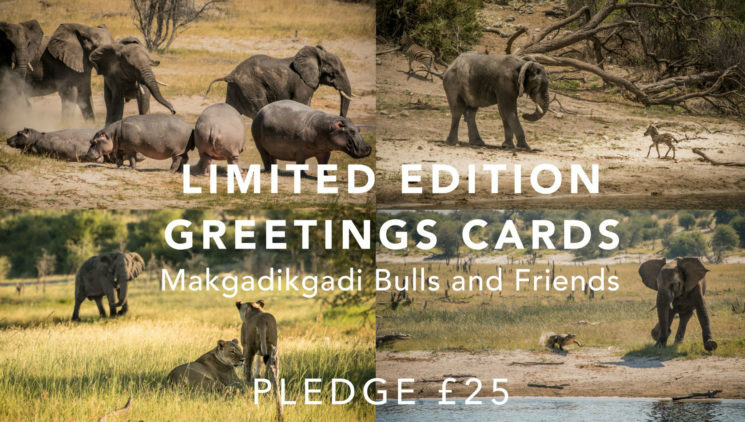 I’ll send you a thank you high quality postcard-style photograph of the bulls of the Makgadikgadi. Stick it on your wall, frame it, or use it as a book mark and feel great about supporting elephant conservation research! Fine art print (10" X 8”): You’ll receive a high quality fine art print from my portfolio of your choice, sized 10" X 8” or equivalent. Printed on c-type pearlescent paper - this dazzling print will remind you of the magic of African wildlife and how precious this species is and you’ll feel great knowing you’ve helped out supporting their future! You will also receive a personalised thank you message and the donor name will be added to my website. Fine art print (16" X 12”): You’ll receive a high quality fine art print from my portfolio of your choice, sized 16" X 12” or equivalent. Printed on c-type pearlescent paper - this dazzling print will remind you of the magic of African wildlife and how precious this species is and you’ll feel great knowing you’ve helped out supporting their future! You will also receive a personalised thank you message and the donor name will be added to my website. The goal of this project is to better understand the behaviour of male elephants, particularly at different stages of life. We have matched different pledge levels with different aged elephants. Improving our understanding of the influence of elder elephants and adolescents on a population will help improve conservation efforts. Read on to learn more about our current knowledge and what we plan to find out. There are stunning prints up for grabs for backers too – see rewards. Click this image to find out more about each elephant. At the current rate of 30,000 elephants killed every year to fuel the ivory trade, its estimated that African elephants could be extinct in our lifetime. There has never been a more crucial time to secure a safe future for Africa’s elephants. Whilst numbers dwindle across Africa – Botswana is a safe haven for elephants and stands as the perfect location to study these animals in their most natural conditions and to better understand their ecological and social requirements. To strive for coexistence with local human settlements, we need to improve how we manage and conserve elephant populations. I argue we simply do not have enough scientific information available on the complex social networks and social dynamics of male African elephants to be making such impactful decisions. Before decisions are made concerning whether we allow trophy hunting of elephants, and what elephants we introduce to new areas when attempting relocations to expand the range of African elephants – we need to first understand the social requirements of this species, this is the focus on this research. Poorly planned species management in the past has often just worsened the situation, and even lead to increased conflict with humans. Male elephants until recently have been cast off as largely solitary – but Elephants for Africa’s research in the Makgadikgadi Pans National Park, Botswana is revealing something far more complex is going on. The Makgadikgadi is a “bull area”, in my first field season from thousands of sightings of elephants, over 99% were males. We witness congregations of males surpassing the hundreds along the Boteti river, where they meet to expand their social network, play, learn from each other and strengthen existing bonds. My research is investigating the types of behaviours that occur between different aged elephants, which ages are more central to the social unit of bull society, the preferred social partners of different ages elephants – and most interestingly whether old bulls act as mentors to the teenagers, as reservoirs of social and ecological knowledge to younger generations. My project will explore the complexities of male African elephant society in the Makgadikgadi Pans National Park, to provide a model of healthy “bull society”, currently missing from the scientific literature. Findings will have a wide reaching impact on wildlife management and conservation decisions internationally, for example in better selection of appropriate targets (if any) of hunting quotas and culling programs and deciding upon suitable population demographics of translocation/ reintroduction schemes. Poorly planned decisions, without a scientific basis could have a negative impact on the wider community (both of elephants, other species, the environment and human settlements). Removal of older bull “mentors” from male society through targeted trophy hunts (Older individuals are the preferred targets in legal and illegal hunting activity, owing to their desirable larger tusks and body size) leading to a loss of essential ecological and social knowledge from communities. And secondly, disruption to the social cohesion of bull society through loss/ lack of mature bulls leading to pre-mature and disruptive musth* in adolescent males. This is in reference to an infamous case where in Pilanesburg National Park, South Africa, a poorly managed translocation of adolescent males and lack of dominant, older bull mentors lead to musth in these young males being entered up to ten years prematurely. They killed 10% of the parks white rhino population, excessively damaged property and trees and even caused human mortality in their enraged state. *Musths a periodic condition in bull (male) elephants, characterized by highly aggressive behavior and accompanied by a large rise in reproductive hormones. Testosterone levels in an elephant in musth can be as much as 60 times greater than in the same elephant at other times. We plan to collect funds at every £1k milestones, as the project is spread over the course of a year, this will enable us to start the project while still fundraising. Passionate and curious about Animal Behaviour from a young age, Connie Allen is now pursuing her career ambitions to be a wildlife researcher in Africa. 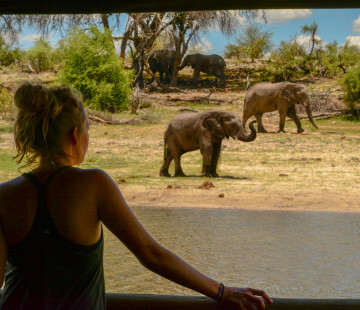 Graduating with a first class degree in Biology from the University of Bristol in 2015 she was quick to move to Botswana to commence her postgraduate on the behaviour of male elephants in the Makgadikgadi Pans National Park. The wider implications and value of her research to the elephant conservation crisis is truly coming to light, and as the project develops we are in need of financial support for its continuation. Funds raised over my goal will go directly to Elephants For Africa, a charity dedicated to the conservation of African elephants. With a central ethos of research to better understand the social and ecological requirements of elephants, Elephants for Africa works closely with local communities to try and reduce human-wildlife conflict, through encouraging appreciation of the benefits elephants can bring to an area, whilst striving to alleviate the problems they can cause. I’m in great need of financial assistance to allow me to continue this vital research – which we sincerely believe will fill a huge gap that exists in our understanding of male elephant social behaviour at present. To strive for human-elephant coexistence in Africa we first need to provide those making management and conservation decisions with the fundamental knowledge as to the social needs of these animals so as to not cause increased conflict with humans. Any donation no matter how small is greatly appreciated! Similarly if you could share this campaign with anyone you know who cares about elephants it will really go far in helping! Fine Art Print: You’ll receive a high quality fine art print from my portfolio of your choice, sized 10″ X 8” or equivalent. Printed on c-type pearlescent paper – this dazzling print will remind you of the magic of African wildlife and how precious this species is and you’ll feel great knowing you’ve helped out supporting their future! You will also receive a personalised thank you message and the donor name will be added to my website. Fine Art Print: You’ll receive a high quality fine art print from my portfolio of your choice, sized 16″ X 12” or equivalent. Printed on c-type pearlescent paper – this dazzling print will remind you of the magic of African wildlife and how precious this species is and you’ll feel great knowing you’ve helped out supporting their future! You will also receive a personalised thank you message and the donor name will be added to my website. Gold Sponsor: For those who pledge over £5000 you will officially be recognised as a gold sponsor of the project, including mention on publications and acknowledgment in media. Platinum Sponsor: For those who pledge over £10000 you will officially be recognised as a platinum sponsor of the project, including mention on publications and acknowledgment in media. If you would like to pledge and not receive a reward email natalie@crowd.science with subject “no reward” and we’ll do the rest.